a dock that was about level with the top of my head. I made it halfway around the world in a sailboat that usually required a dinghy to get to shore and was pretty much inept and doing so myself. It was the equivalent of living in the boonies, owning a car and needing it for transportation for necessities, and not knowing how to drive. Wayne, on the other hand, is a great dinghy driver. I felt like this when it came to dinghy outboard command. Photo credit to Paul L Dineen. The dinghy that came with our sailboat went into the scrap heap (click here to read about that) sporting an unreliable 16-year-old Johnson dinghy motor. Our replacement dinghy was leaky and still powered by the Johnson, which required way more than 3 pulls (click here to read about that) and IMHO Wayne's superior mechanical skill to run. 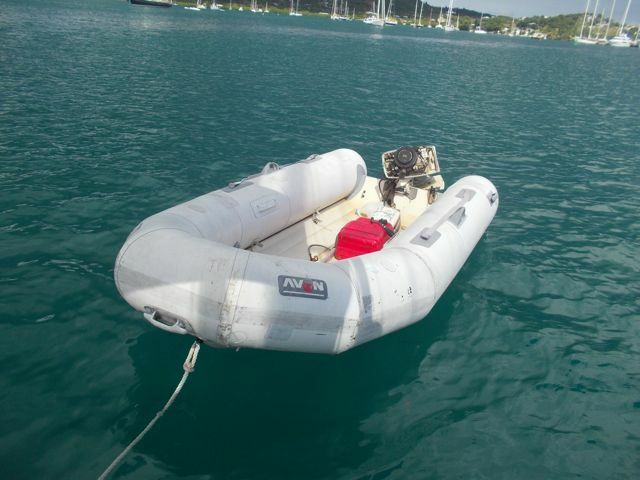 When some kids playing on the beach St. Lucia launched our dinghy well into the bay, Wayne swam after it at his peril. I'm a much stronger swimmer and am far more adept at dragging myself into the dinghy from the water than Wayne. But we both knew I wouldn't be able to start the motor once there, and it was too far to row. Outboards come equipped with oars, but most inflatable dinghies row poorly, especially if there is only one rower. Does this look like it would inspire confidence? 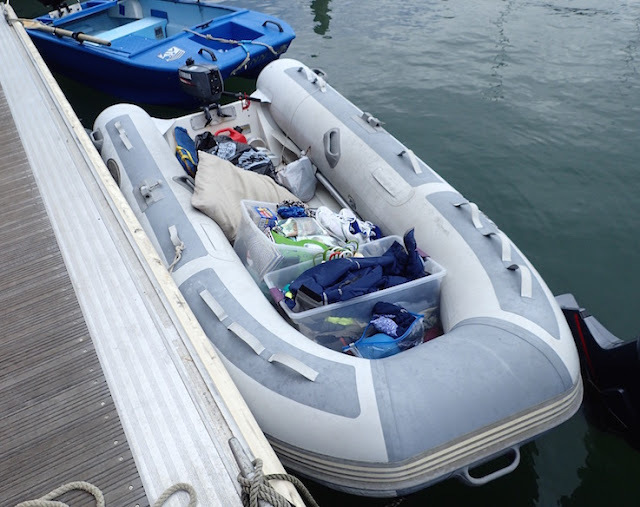 Eventually, we replaced both our dinghy and its outboard motor with a new one (click here to read about that). It took a while for us to trust and master our much smaller, 8’ dinghy and its wimpy 5-horse Yamaha motor. If we had it to do over again, we determined the 5 horse was the worst of both worlds.... Still too small to plane with anything other than just one person and nothing else. A smaller engine would've been far more tote-able and not really any slower. 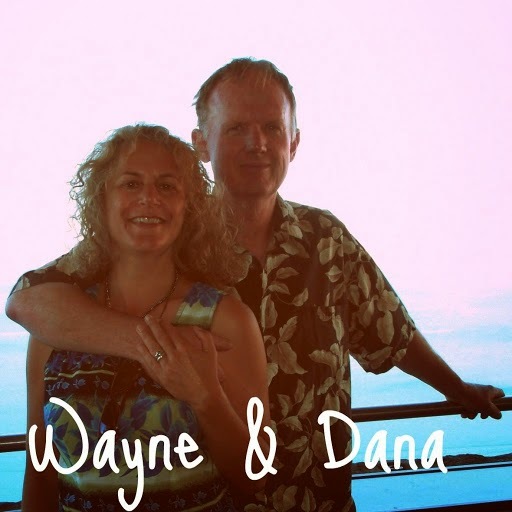 With increasing reluctance, Wayne continued as our sole dinghy driver, which all too often meant chauffeuring me from our boat to where I wanted to go. Sometimes I needed or wanted to do something ashore when he needed or wanted to be on the boat. What if something happened and Wayne was unable to "drive"? It was time and then some for me to buck up and captain my own pint-sized chariot. That meant learning to start a motor with a gas lawnmover-like “pull” – also something I’d never done. Pathetic, huh? I felt like such a loser, embarrassed, frustrated and stupid. Miraculously, after several failed attempts, and more than a few fights, a justifiably exasperated Wayne successfully taught me enough that I was able to get it. Bit by bit, I gained competence and confidence. Maybe a little too much of the latter. I ran out of gas in the middle of a full plane a couple hundred yards from our boat, so sudden it practically launched me. The captain of a neighboring boat in St. Thomas’ Long Bay, rushed to the rescue and quickly towed me the short remaining distance to our boat. I could’ve used our oars, but they’re pretty clumsy, and my neighbor was quicker and happy to play hero. Of course, if I remembered Wayne’s instructions on how to switch to the backup gas tank, I would’ve been fine too. She looked like she still planned to use my failure to buy herself more time. I empathised, even though I did mean what I said. Still, I trusted my arms and legs more than motors and prefered to kayak whenever I could. 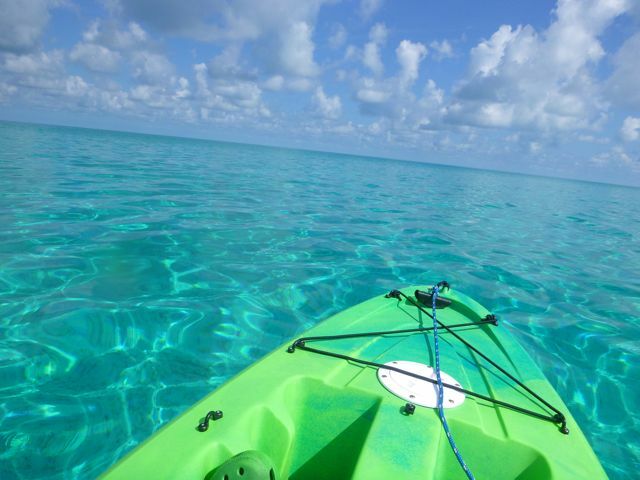 My arms and legs don’t run out of gas, and I don’t have to pull some scrawny cord “just right” to start, and I enjoy zen-like exercise kayaking provides. Wayne, one of many times working in Journey's engine. 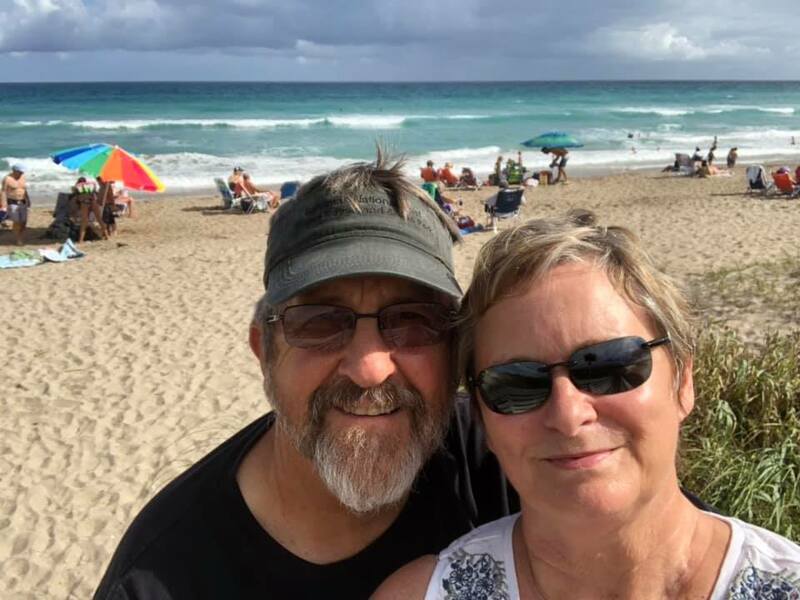 When we got stuck over a month with engine trouble (click here to read about that), Wayne had his head up our motor A LOT. That forced me to solo across Gregerie Channel’s gusty, choppy, wake-filled, mile-long expanse to Crown Bay Marina’s ridiculously overcrowded dinghy dock. By necessity and practice, my dinghy driving skills improved dramatically. Nonetheless, I got a humbling reminder my confidence still surpassed my lack of basic knowledge. Untrue to my word, I did run out of gas a second time. Once again it was just a few yards from my boat. Gregerie Channel’s current rocketed through our anchorage. Whilst I scratched my head, again trying to remember how to switch to the secondary fuel tank, a neighbor rescued me about 200 yards downcurrent. 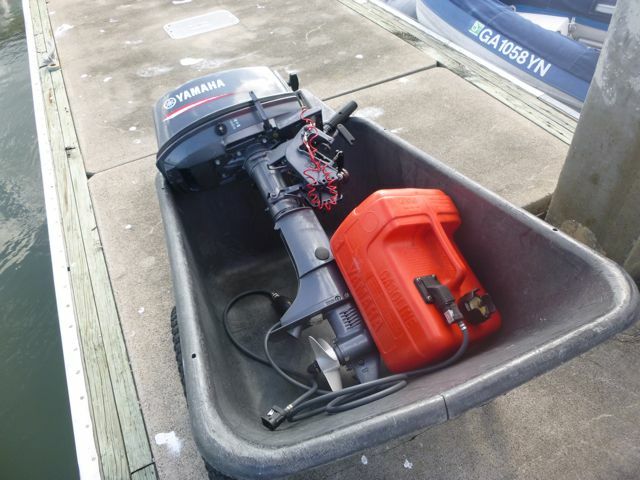 Our Yamaha outboard had more lives than a cat. Machine or not, it was not, however, immortal. After we completed our first year of cruising we tucked into Jacksonville Florida for hurricane season, where we put our dinghy into storage as we didn't need it to get around from a marina dock. Unfortunately we learned some hard lessons on how not to store and fill your outboard motor. The result was a very temperamental outboard. Once again, it took Wayne's competence as a mechanic to run it, and even then it often required much cursing and repair to work. Our increasingly surly outboard and my flat refusal to drive it was a continuing bone of contention. Admittedly, I did manage to pilot my in-laws around in the Bahamas when they visited. 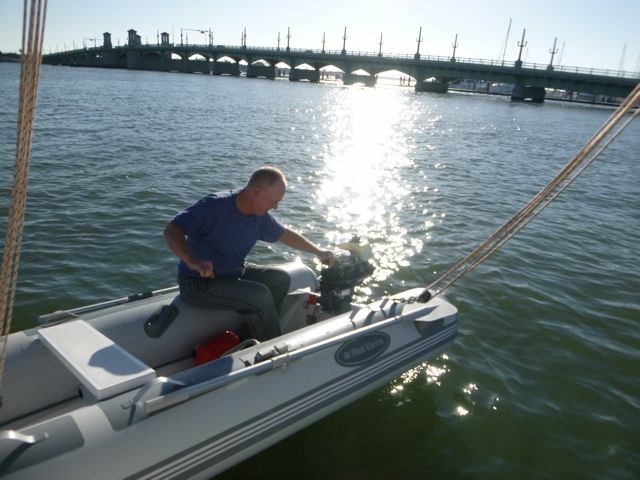 Crossing a broad expanse of choppy water, when there were three of us who needed a ride, my significantly lighter weight than Wayne's made me the logical driver choice. I like my in-laws, even if I didn't like driving. We weren't too much worse for the wear. Dinghies often live a tough life, cruising. As tides shift and waves unfurl, it's not unusual to misjudge where to park your dinghy, to your peril. Too far offshore can lead to some real dilemmas getting the dinghy back to the water if the tide drops too much. Too close to the shore and a rising tide or rough water can result in dinghies getting trapped and bashed under docks, and swamped by waves. We learned that lesson more than once, though we have good company. Regardless, a swamped motor is not a happy motor. And ours definitely got swamped. One of many happy paddles aboard one of my cruising kayaks. This was my West Marine Abaco sit-on-top in the Bahamas. While in Jacksonville, much to Wayne's dismay, I bought a kayak and insisted we find a way to make room for it. He was not happy that my kayak hogged up precious space on our side deck. Though turns out the kayak gave me an often excellent alternative to relying on Wayne for dinghy rides (or hitching rides from other cruisers). So much so, that when my kayak went AWOL in Tonga, Wayne could hardly wait for me to replace it. 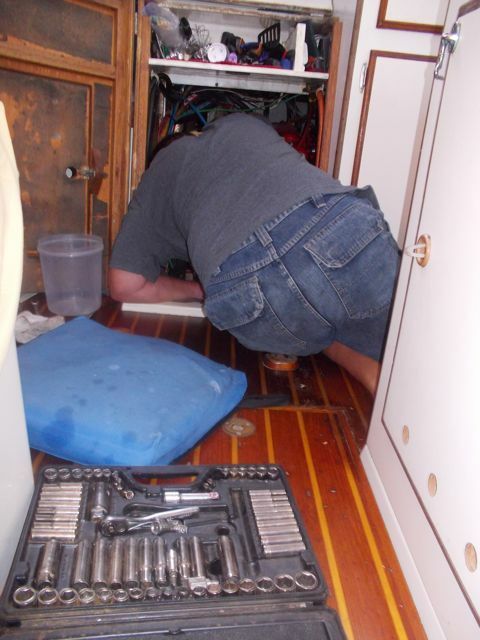 All too common a scenario; Wayne repairing our ailing Yamaha outboard. When the time came to sell our boat in Australia and everything on it we weren't taking with us for camping and then later as commercial airline luggage, once again, I had to give up my kayak. There were still many dinghy trips required to empty our boat of our possessions. After the third time in a week our outboard died in 100 degree temperatures a long ways from the dock and our boat, my temper got far hotter than the air temperature. I considered offering to swim-tow our dinghy back, but was not too keen on entering the opaque anchorage waters with the bull sharks we knew were there. I got so angry I threatened to divorce Wayne "if something wasn't done about our f---ing outboard motor!" Even though we were done cruising in less than two weeks, there were still many more dinghy trips required to complete emptying our boat. Wayne wasn't too happy about the situation and had rarely seen me that angy. He dutifully took our motor to a local outboard mechanic who declared it was "a piece of sh--" and that it was amazing it ran at all. Wayne patted himself on the back that he'd managed to make it run for so long, despite the mechanic's declaration. I felt gratified the professional assessment of the motor confirmed it wasn't remotely worth fixing. In each of our own ways, we were satisfied with the prognosis. This little baby was our marriage-saver for our final week and a half aboard Journey. The tiny two-stroke outboard that could, used in our final days unloading Journey in Australia. Wayne bought a 2-horse motor that got us by for our final week and a half. I drove it with a fair chunk of the time without too many issues, I had a little trouble with the pull, and in remembering how frequently a tiny gas tank needs topping off. Still, after such a long sordid history with outboards, I didn't entirely trust it. 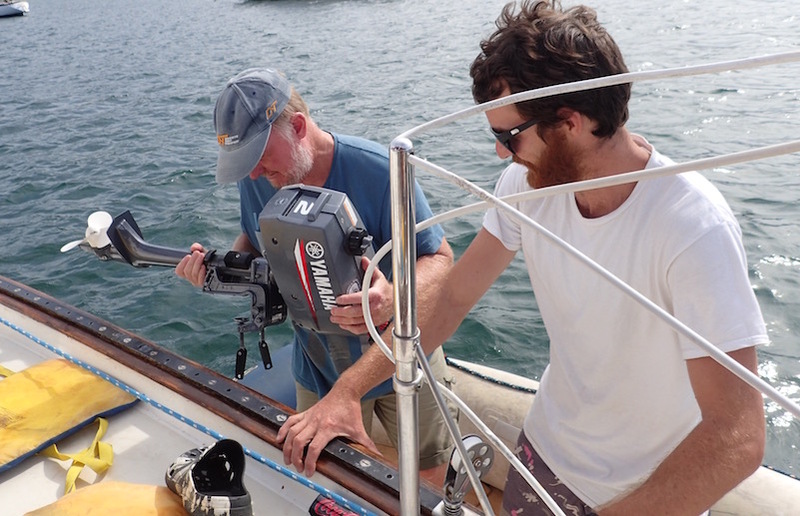 We sold the outboard to a cruising friend as backup motor for not much more than we paid for it. Everyone was happy. 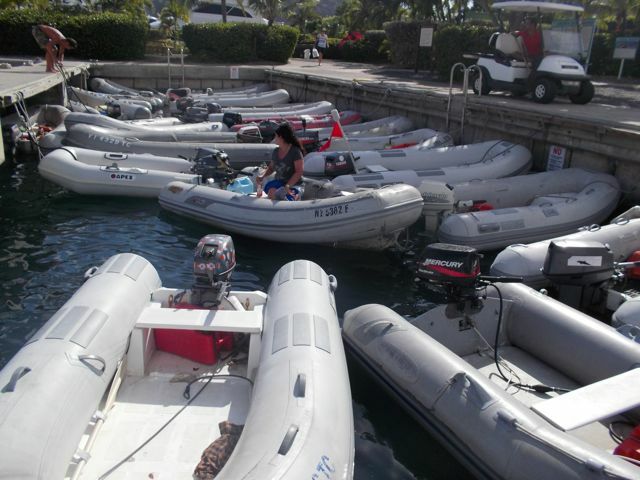 With our boat sold, the issue of dealing with outboards went away -- one aspect of cruising I would not miss. Our current boat, trawler Serendipity with a different kind of dinghy and motor. We found ourselves unexpectedly back aboard a boat -- this time as live-aboards instead of as cruisers. The trawler was a rather miraculous solution to Portland Oregon's hideously expensive rental market and a testament to some amazingly generous friends. 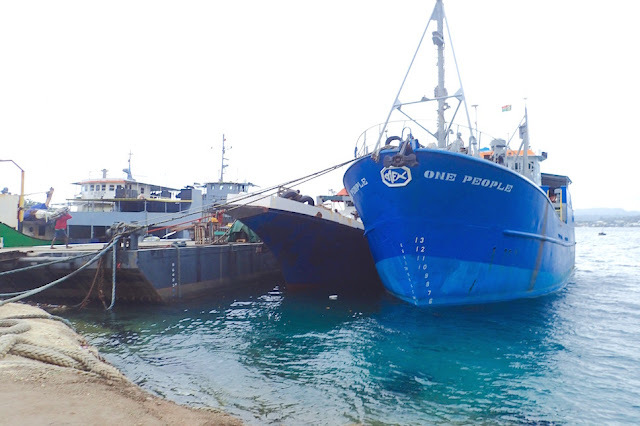 We spent most of our time docked in a marina, so there was no need to use the dinghy to get from the boat to shore. When we were "on the hook" I either used my kayak to get to shore, or, once again, Wayne drove. Embarrassingly, though the dinghy and its motor were in good working order, I never tried to drive it. Kai on deck. His safe transport was a very good reason to get my dinghy outboard skills in order. We're now living in Florida, "dirt dwellers" (not live-aboards) for now. 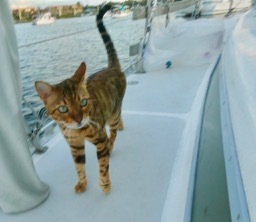 When I offered to kitty-sit for friends Don and MaryAnn who are live-aboards, I assumed they were docked at a marina, as we met when we both were docked at Ortega Landing in Jacksonville Florida. The enormously overpriced cost of docking at the marina pushed our friends to opt instead for a more affordable mooring ball. That meant I had to dinghy from boat to shore and vice versa. Part of the time the kitty-sitting I would live aboard, and part of the time the kitty, Kai, would be with Wayne and me in our apartment. Wayne was relishing a staycation... me on the boat, and him, off work with our apartment all to himself, able to glory in caveman mode. Kai's chariot; Don and MaryAnn's dinghy with a well cared for, easy-to-start outboard motor. That meant not only did I need to get the hang of the dinghy, I needed to do so with precious "cargo" -- kitty Kai. Ultimately I needed to solo dinghy with Kai for three trips. 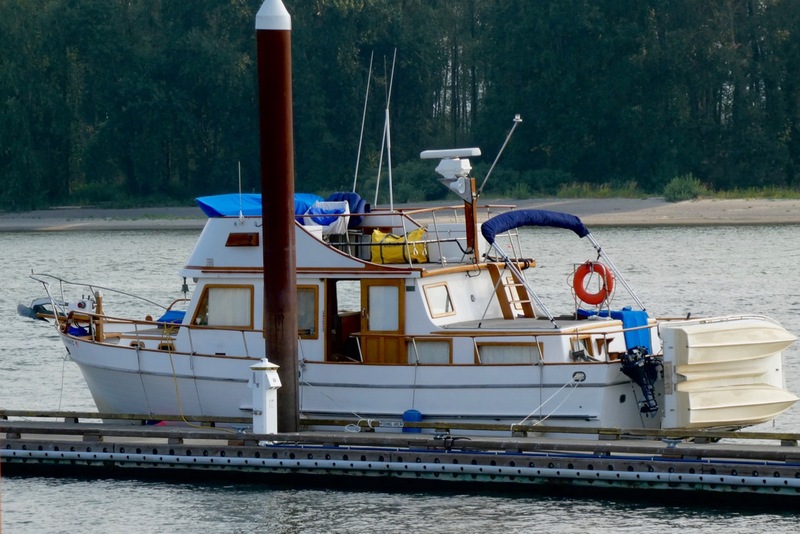 The distance from the dock to the boat loomed so very large to me, MaryAnn and Don's boat seemed lost in the distance of a huge mooring field of boats. One of Wayne's favorite sayings is that "Everyone is born with a bag of experience and a bag of luck. 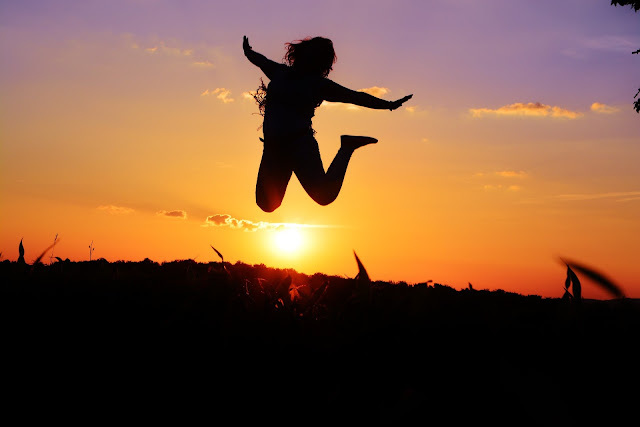 The trick is to make sure your bag of experience fills up, before your bag of luck runs out." In this case, had a good grasp of both bags. Don and MaryAnn. Savvy cruisers, loving parents of kitty Kai and all-around great folks. As luck would have it, Don and MaryAnn put a lot of effort into finding a good outboard, and maintaining it well. Don is also an excellent teacher, clear, kind and patient. He and MaryAnn backed that up with a trusty set of articulate how-to index cards they put together, with one on running the outboard. As for experience... I figured it was providence -- that this opportunity arose because I was destined to finally learn it was possible to become one with the dinghy. It was my own little "I am your density" "Back to the Future" moment. I committed to cat-sit, adored Kai, and my friends Don and MaryAnn. I could do this. I would do this. Don had me drive the dinghy a couple times with him, which included picking up Kai as the first part of his stay would be at our apartment. Still, as good as Don was, I had a lot on my mind and felt a bit like a kid whose driving learner's permit just got converted to a regular license without much practice or ever passing a driving test. If Don was worried, he hid it reasonably well. I attempted to project far more confidence than I felt. My first trip solo trip driving the dinghy was bringing Kai back to the boat. I was triply stressed. It was my first solo run with the dinghy. I had an unhappy kitty in tow. And I was running late for a meeting with someone ashore that was best done after Kai was safely ensconced aboard MaryAnn and Don's boat. It did not help that a distressed Kai meow-meow-meowed nearly nonstop the hour and and quarter drive out to the marina. The boat was in neutral, the starter clip was on. 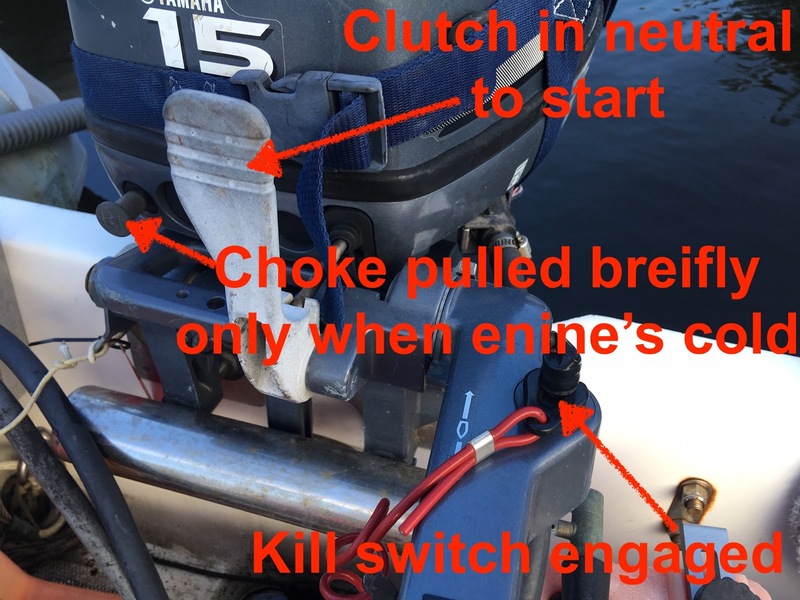 The throttle slightly turned up, as was instructed, I remembered to pull the outboard choke and quickly put it in, which was needed as the outboard had sat for days unstarted. Pull. Pull. Pull. No luck. More pull, pull, pull. No luck. Squeezing this bulb until it's stiff ensures there's gas making it all the way to the engine for starting. I quickly accepted help from a passing cruiser. "Squeeze the gas line bulb until it's stiff," suggested the cruiser. Still didn't work. 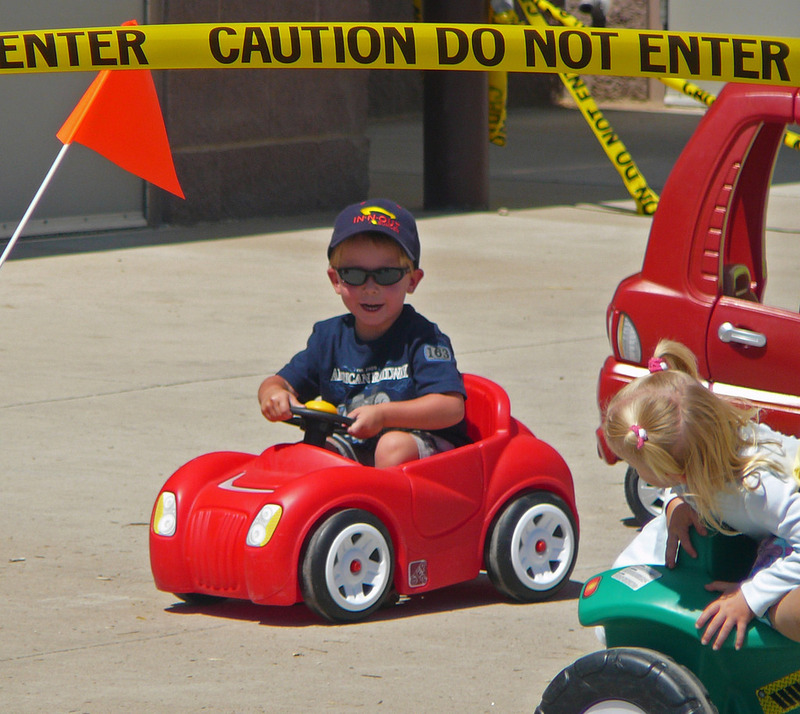 Eventually, he got the engine started. What he did differently, neither of us were quite sure. I got to the boat without further issues (although Kai didn't cease meowing as he was transported bumpily into the dinghy), unloaded Kai, quickly got him situated and took off for my meeting. I was so worried about restarting the boat, I left it running while I was aboard, though I did properly shut the boat down at the dock. After my meeting ashore I returned to the dinghy with great trepidation. Once again, I had trouble starting it and accepted help from yet another friendly cruiser. Much as I hated asking for help again, I know the cruising community is amazing. I trusted that in Don's absence, I could still get past my anxiety and learn what I needed to run the outboard. 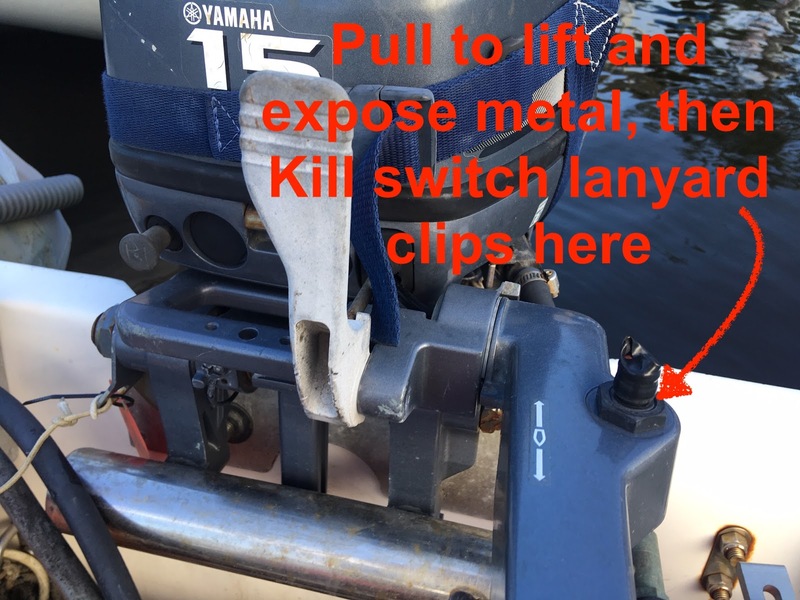 Remembering to attach the lanyard with the clip properly engaged is crucial to starting an outboard. This time, after several more false starts, we traced the problem to the way I slid on the starter clip. It was engaged over the protective electrical tape, when it needed to be a smidge lower, so it could make metal-to-metal contact. I realized that was likely the problem the last start time, too. and the neutral starting position for the choke. From that point on, I was able to get the dinghy started first pull. And I got much more comfortable and competent driving the dinghy as well, ably picking my parking path into tightly packed dinghy docks and back to the boat. Don and MaryAnn's boat became easy for me to spot in the mooring field, which wasn't nearly as large as some we'd stayed in before. Nor was the boat as far away from shore as it initially seemed. I also was able to overcome my trepidation dinghy driving tn in wind and rain, as that rolled through during my stay. I even gave a couple other cruisers a lift to their boats, and they didn't even appear uncomfortable with my driving! I profusely thanked Don for the opportunity to finally overcome my fear of outboard dinghy driving. He told me he and MaryAnn put in a considerable amount of effort into selecting and finding the particular motor they bought -- a 15 horse Yamaha 2-stroke, as it's known for being easier to pull-start. They make sure to maintain their outboard well, as 2-stroke outboards are no longer sold in the US. "Do not buy a Honda," he advised. Going forward, I commit to learning to run the outboard we have on our trawler's dinghy. If that proves too difficult, I plan to insist on following MaryAnn and Don's path - making sure that whatever outboard we have does not require mechanical skill to run. That said, I still will opt to kayak from time to time, just for the joy of it. And if you find yourself un-mechnically inclined, like me, take care in your choice of outboard selection, and consider bringing a backup. Don and MaryAnn's boat (where after nearly 7 years I finally "got" dinghy handling last week), is moored in Sunset Bay Marina, Stuart, Florida, Latitude 27.12.004N, Longitude 80.15.515W. That's about 1 1/2 hour's drive from where we're currently living.